Loy Krathong and Yee Peng: Two festivals at the same time! In Northern Thailand and especially Chiang Mai, Loy Krathong is special because it is celebrated together with the Yee (Yi) Peng festival. 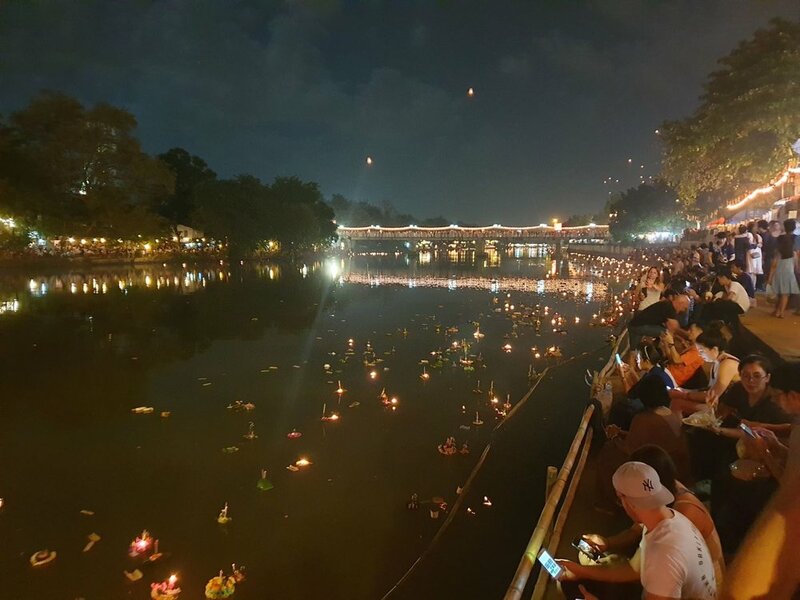 To be clear: Loy Krathong is about floating lights on the water, Yee Peng is about floating lanterns into the sky. So in Chiang Mai, you can do both! Yee Peng is particular to the Lanna culture of Northern Thailand, and even though Loy Krathong festival sees people release lanterns in the sky in many other places in Thailand, Chiang Mai offers the real deal. Before the festival, the citizens of Chiang Mai decorate their homes, businesses and temples with colorful lanterns. What are Loy Krathong and Yee Peng? As with most of the festivals in Thailand, Loy Krathong and Yee Peng are about giving thanks ('merit') and offering praise to Buddha. The festivals are held around the full moon of the 12th month of the Thai lunar calendar. It is believed that at this time the rivers are fullest and the moon is the brightest. Loy Krathong is to give thanks to the spirit of the river and the water it provides. This is done by floating a basket ('Loy Krathong') with a candle, flowers and sometimes money on the river. Yee Peng's release of lanterns (Khom Loi) into the sky against the bright full moon, the best time of year to give merit to Buddha, symbolizes the leaving of darkness into a bright future. Making wishes to Buddha as you give merit this way is part of the tradition. Special events: Where to go during Loy Krathong and Yee Peng? The 2019 Loy Krathong and Yee Peng festivals will take place from Monday, the 11th to Wednesday the 13rd of November. Loy Krathong itself is on Wednesday the 13th. In the week before the festivals, you'll see lanterns being hung up all around the city, but particularly at the Three Kings Monument and at Thae Pae Gate. Particularly the installation of many colorful lanterns at the monument is worth to check out. This is also the place where we expect the festival to start on the 11th, with after around 18:30 the first candle lighting ceremony. Across the street, at the Lanna Folklore Museum, some of the official events of Yee Peng festival takes place from around 19:00. These include traditional (Lanna) dance performances and beauty contests. However, the official opening in 2019 is likely to be at Thae Pae Gate (a 5 minute walk from there). The Yee Peng Lantern Procession Contest will start there around 19:00 and will move over Thae Pae Road to the Night Bazaar. Chiang Mai Municipality Office will meanwhile host a Yee Peng Kids Contest. You can find the Municipality Office by going all the way down Thae Pae Road and turning left before the bridge. In this area, on either Thursday or Friday, boat races will take place on the Ping river. On Yee Peng, there are two mass lantern release events. The second biggest one is at the Horizon Village, 40 minutes East of the city in Doi Saket. It takes place on both the 12th and 13th (Tuesday and Wednesday) and starts around 16:00. The event includes traditional and modern Northern Thai (Lanna) foods and cultural events, entertainment by the Lanna Wisdom School, music as well as religious happenings and a botanical garden tour. And of course, the simultaneous release of thousands of lanterns! There will be 3000 tickets available for each day. Tickets cost 3199 Baht per person including pick up and drop off with a red pick up truck from the city of Chiang Mai. Pick up meeting point will be at the Old Chiang Mai Cultural Center at 16:00 and you will return here around 23:00. Tickets include 2 lanterns, Thai buffet dinner, souvenir, transportation and a bottle of water. At PM Tours we offer tickets to this event, so just scroll down to go to the booking form or contact us for more information. Yee Peng Lanna International used to be a large public event right next to Maejo University (north of Chiang Mai city) but was turned into this paid event. The current event on Tuesday the 12th has room for 4000 people, with tickets starting above $100 and running up to several hundred dollars. 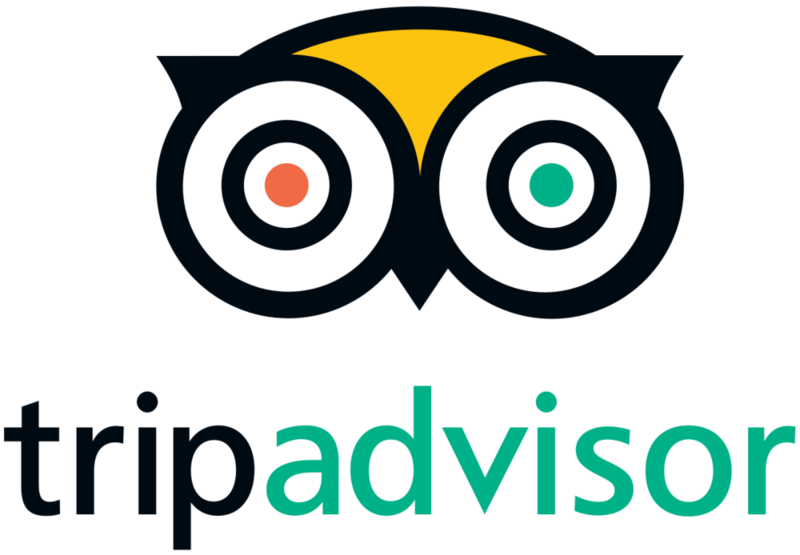 It features cultural exhibitions, religious rituals, food and beverages and of course the simultaneous release of thousands of identical white lanterns (a great photo opportunity!). On Monday the 11th of November, you can buy or decorate your own floating offer (Krathong Sai) at most of the bigger temples in Chiang Mai, such as Wat Jed Lin, Suan Dok, Chiang Yuen, Bupparam, Nuntaram, Chai Sri Phoom, Ramphueng, Chai Mongkol and Jed Yod. You can also buy a handcrafted Krathong at the riverside markets that spring up between the Nawarat and Ratanakosin bridges. These markets run all the way to Thae Pae Gate. You can also buy your flying lanterns here for as little as 50 bath if you're lucky. This is where Loy Krathong and Yee Peng really come together. 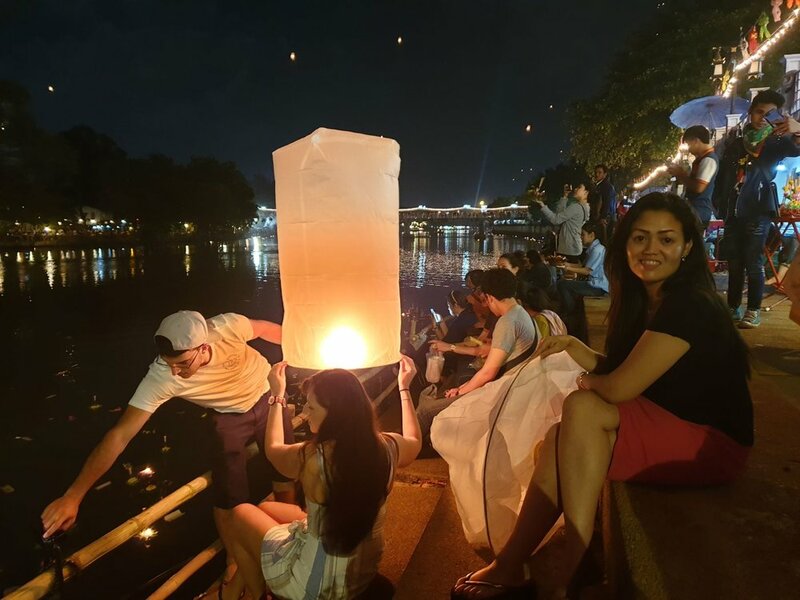 On Tuesday evening, crowds gather on and between the Nawarat and Ratanakosin bridges and launch thousands of banana-leaf Krathongs and hot air lanterns in the river and the sky. The sight is amazing and truly bucket-list worthy. The atmosphere is great because everyone, Thai and foreigner, is there to enjoy the amazing view. You'll see thousands of lanterns bobbing away in the air and on the water like a great swarm of migrating fireflies. Around 22:30-23:00 there are fireworks here and you'll hear firecrackers going off all evening. The banks on both sides of the river offer plenty of places from where you get a good view of the spectacle. Local events at temples and around the city continue on Wednesday. In the evening of Wednesday the 13th (around 18:00) the Grand Krathong Procession Contest starts from Tha Pae gate. It then moves over Tha Pae road towards the river. The procession finishes at the Chiang Mai Municipality Office and features beautifully decorated floats, dancers and bands. Be sure to visit Wat Phan Tao, a small temple two blocks south of the Three Kings Monument. Walking south on Prakpokkloa Road, it is on your right side, next to the much bigger Wat Chedi Luang temple. In the days before Yee Peng, the monks decorate their little orchard with hundreds of colorful lanterns and it creates a magical, fantastical sight. During Yee Peng and Loy Krathong, they hold sermons that increase the unique atmosphere of this place. Wat Chedi Luang is definitely also worth the visit while you are there, though it has an entrance fee. As always at temples in Thailand, make sure you are dressed properly and act respectfully. For religious festivals, it shows good form to dress in white. Many people don't know this, but when entering the temple, or really any building in Thailand that has one, you are supposed to step over the door sill. A door sill (doorstep) has spiritual significance because it belongs to the spirit guardian of the building. Respecting this boundary is believed to keep out evil spirits. Lighting a hot air lantern is really a two-person job. After you buy your lantern and have arrived at the place where you want to release it, carefully unfold it. While one person holds it up, the other lights the flame source. Depending on the lantern this might take a while, so we advice using a press-button lighter. Be patient after you light the flame; it will take a few minutes for the lantern to fill with hot air. Releasing it too early can be unsafe as the lantern may come down again. Because seeing your lantern crash is not only disappointing but also bad luck, we counsel taking a few extra minutes. Just to make sure your lantern takes a good flight. Don't forget to make a wish when you release it! When at crowded places such as on Nawarat Bridge, where many lanterns are being lit and released around you. Make sure you keep your awareness. Keep an eye on anyone releasing lanterns behind you that will float over you. Enjoy the moment but also be sensible about where you stand. On Nawarat Bridge, we advise not to stand near the side. Sometimes, an elevated row of electric lights there catches lanterns, which subsequently catch fire and fall down. For booking tickets for the Yee Peng Lantern Festival 2019 at Horizon Village Chiang Mai, please complete the form below. Which day would you like to join the festival?